Grate the sweet potato and fennel bulb using a standard box grater, reserving the fennel fronds. Mix the sweet potato and fennel with the salad onions, flour and 3 eggs until evenly combined. Season with salt and pepper and set aside. In a non-stick pan on a medium heat, add a little olive oil and a small knob of butter and drop 2 tablespoons of the sweet potato mixture to form 1 hash brown. Fry both sides until golden for roughly 4 minutes each side and then remove the hash brown from the pan and place onto paper towel to soak up excess oil. Continue until the mixture is finished. Preheat the oven to 200’c and while the hash browns fry, place the Tenderstem broccoli onto a roasting tray, drizzle with olive oil and sprinkle with grated hard cheese. Roast for 10—15 minutes until the broccoli begins to char slightly. Mix the crème fraiche, Dijon mustard, lemon juice and fennel fronds and season to taste. 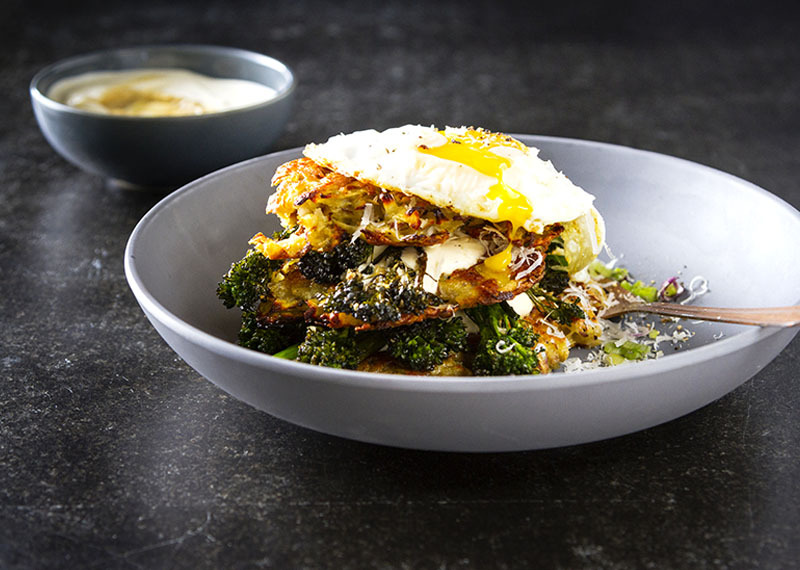 To assemble smother the hash browns with a layer of the crème fraiche mix. Top with tenderstem broccoli and repeat. Finally top with one fried egg. Season with salt and pepper and enjoy.